While DC Comics is working through a gender controversy, Marvel Comics has taken a step forward in representing racial minorities in their super-hero comic books. On Tuesday it was announced in USA Today that Spider-Man would now be a half-black, half-Hispanic teen named Miles Morales (right). The story is not being told in Marvel’s flagship Amazing Spider-Man (where Peter Parker is still swinging through New York City, white as ever), but instead in Ultimate Comics Spider-Man, which starts with a new issue #1 by writer Brian Michael Bendis and artist Sara Pichelli (yes DC, a woman!) in September. The Ultimate Comics imprint is set in a younger alternate universe, apart from the bulk of Marvel’s comics. Since the licensability of Marvel’s big characters, which date back to the 1960s and ’70s (and some to 1939), is dutifully protected in Marvel’s main line of comics, the Ultimate Universe allows creators just a bit more leeway. This is easily the best example of that leeway, and could be a refreshing signal of things to come for that imprint. 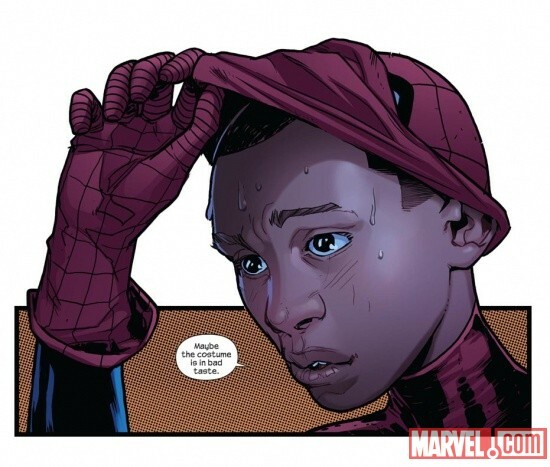 The first appearance of Miles Morales as Spider-Man is in the just-released Ultimate Comics Fallout #4, which itself spun out of the recent “Death of Spider-Man” story. He’s right, but this helps. Of course there have been plenty of foolish reactions, from anonymous internet posters trying not to sound too racist to Glenn Beck‘s weird conspiracy theory. Fortunately, cooler heads prevail, and have been celebrating what was unthinkable even five years ago. Why unthinkable? Because comic books with black leads have historically been a tough sell. The Black Panther, comics’ first headlining black hero, has had intermittent series since his debut in 1966. Todd McFarlane’s Spawn is the only comic book series to star a black or African-American in the starring role to last so long (although Al Simmons was replaced with the white Jim Downing last year). Heidi MacDonald at The Beat explores this issue and more in this well-written piece.